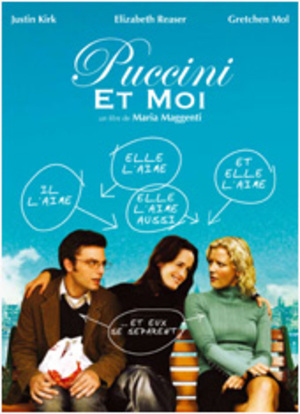 At the last minute the other night, I decided to go see Puccini for Beginners the new romantic comedy by Maria Maggenti. Just before the movie started, there was an announcement that Maria was doing a Q& A after the movie. Vincent my partner said that he had known Maria very well in New York a long time ago and had lost contact with her. He said what a wonderful treat it would be to see her. After the movie, Maria, looking all blonde and pretty, asked if anyone had any questions, and Vincent bolted out of his seat and said “Hi Maria, it’s Vincent from New York…” and of course she screamed "Oh, My God! Vincent!…..”, so Vincent ran up to the stage and hugged her. After the Q& A, she asked us to go out with her and her friend Allison to have a glass of wine. We went to Café Beauborg and a glass of wine became dinner and 2 bottles of wine till 12:30AM. I didn’t really know Maria and we couldn’t even figure out if we had ever met before, but we connected immediately and became instant buddies. It turned out to be one of the most fun, engaging and stimulating nights I’ve spent in a long time. Maria is funny, bright, passionate, earthy, and just a joy to be with. She told us juicy insider gossip about the making of the movie and all about Justin Kirk, a major heartthrob of mine. Allison who was also a delight had worked with Maria as writers on “Without a Trace”. Now about the movie. The romantic comedy genre is one of the toughest to get right and Puccini for Beginners does it with flying colors. The classic boy meets girl, boy loses, girl, boy gets girls back storyline is updated to: girl has girlfriend, loses her, same girl meets a guy who has broken up with girlfriend, then the same girl meets the ex-girlfriend not knowing she’s his ex, and I won’t tell you the rest because I want you to go see it. This is one of those rare sophisticated comedies that has the screwball element that makes you laugh out loud. The mostly New York west village locations romanticize New York in a way I haven’t seen since the Woody Allen movies of the 70”s. Elizabeth Reaser as Allegra the central character is the perfect combination of smart, funny, flirtatious and neurotic and you can see why everyone falls in love with her. Justin Kirk as the preppy professor and Gretchen Mol as the ditsy glass blower are very appealing as Allegra’s lovers and the rich supporting cast of lovable New York stereotypes is perfect. The writing is razor sharp and the clever lines never stop. 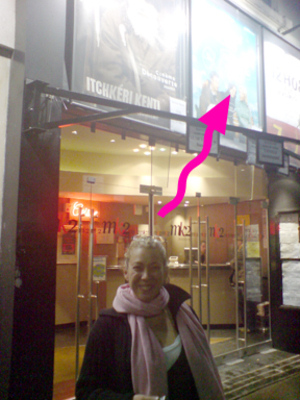 So please run to your local cinema to see Puccini for Beginners because it’s wonderful and to support my friend Maria. One last note: a girl in the audience during the Q&A was so inspired by the movie that she publicly proclaimed that she wanted to experiment with women for the first time. Viva Maria! In theaters now in France and limited cities in the U.S.- New York, San Francisco and Los Angeles so far.